We should be ashamed that all the ingredients are completely store bought, but we aren’t. We saw these adorable things on Pinterest, and HAD to make them. Kids or very easily entertained adults (such as us) will find these things as cute as they are delicious and easy to make. Seriously, these things are super easy, as in, if you can remove the stem of a strawberry, you can make these. So, beginners or people too drunk to deal with actual baking, these are for you! Also, you’re welcome for that gratuitous, nip-slip pic. Merry Christmas! Remove strawberry stems by slicing cross-wise. This will create the flat surface you need to keep your hats from slipping. 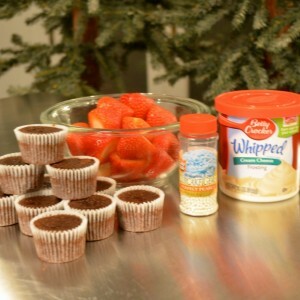 Invert strawberries onto the individual brownie cakes. Place strawberry cut side down on cake. Using a pastry bag fitted with a small tip, outline the strawberry around the top of the cake and add a dollop to the tip of the strawberry*. And, voila! 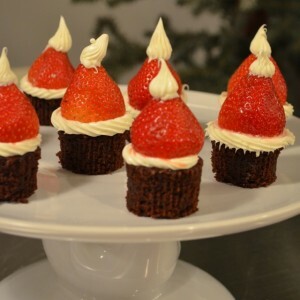 adorable little, edible Santa hats… on a African American Santa. See how multi-cultural we are! *Our resident Mr. Know It All, Chris, happened to over when we were whipping this up. He informed us that we should line the top edge of the brownie and NOT to just put a bunch of icing on the top of the brownie and lay the strawberry on top. Why you ask? Because the sugar from the icing will begin to pull the liquid out of the strawberry and eventually it will slide right off the icing (as our first few ones did). This random knowledge is why we hate him he has a corner, people! One Response to "santa hat brownies"